It’s easy to get sun-kissed in the summer, but what if you what to get your glow on without risking the damage of the sun’s rays? We tracked down one of the hottest beauty products on the market right now, and the savings are even hotter. Anastasia Beverly Hills Ultimate Glow Kit features six metallic powder highlighters for intense luminosity. The complementing shades can be layered together or worn separately. 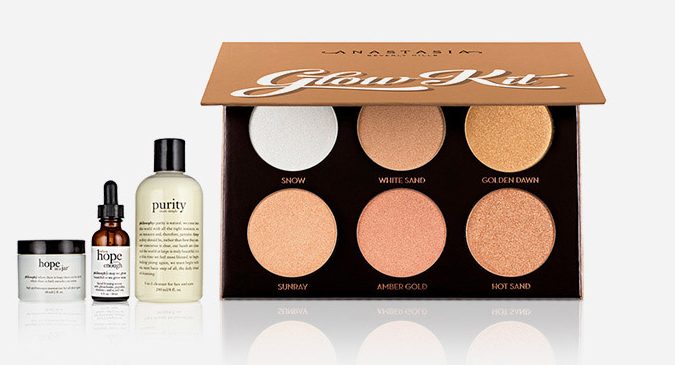 Regularly $45, the Anastasia Beverly Hills Ultimate Glow Kit is on sale for just $22.50 during the Macy’s Black Friday in July sale. And if you decide the Estee Lauder is your favorite product to get your glow on, just know you’ll also receive a FREE 7-piece Gift with any $35 Estee Lauder Purchase (A $130 Value!) now through July 17. No matter how you choose to illuminate your skin, you’ll be happy to know that not only will you get a great price, but you just might get a bonus gift too!